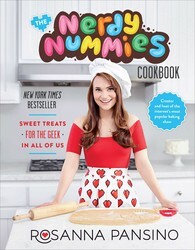 Take your cheesecake to a high-tech level with this clever recipe from The Nerdy Nummies Cookbook. Wi-Fi helps people all over stay connected to the Internet from almost anywhere. I designed this cheesecake to look like a Wi-Fi symbol when you cut into it. Once you’ve made this recipe, connecting to the internet will be a piece of cake! 2. Make the crust as directed, pressing the crumb mixture 2 inches up the sides of the 9-inch springform pan. Bake for 10 minutes to set the crust. Remove the pan from the oven to cool, but leave the oven on. 3. Make the filling as directed. Measure out and set aside 2 cups of the filling and pour the rest into the prepared crust and spread evenly. 4. Tint the reserved 2 cups of cheesecake mixture with electric blue food coloring until you reach the desired shade of blue. 5. Scoop the blue mixture into a decorating bag fitted with a #12 tip. 6. Pipe a 2-inch-diameter circle in the center of the cheesecake. 7. Pipe three concentric rings around the center circle. 8. Bake, cool, and chill as directed. 9. 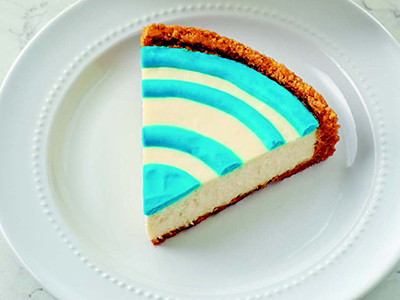 Cut the cheesecake into portions to resemble Wi-Fi signals. 1. Make the crust: In a large bowl, whisk together the cookie crumbs and sugar. Stir in the melted butter until the crumbs are evenly moistened. Press the crumb mixture onto the bottom and 2 inches up the sides of a 9-inch springform pan. Bake for 10 minutes to set the crust. Remove from the oven to cool, but leave the oven on. 2. Make the filling: In a large bowl, with an electric mixer, beat together the cream cheese and sugar until smooth and light. 3. Beat in the eggs, vanilla, and cornstarch until just combined (do not overmix). 4. Mix in the sour cream until well blended. 5. Pour the mixture into the prepared crust and spread evenly.